This is the public profile of Murat Bengisu, Additional information and high-resolution images are available for accredited press members, to access additional information about Murat Bengisu please login as a press member. About Murat Bengisu : After receiving his M.S. and Ph.D. degrees in the field of Materials Science at New Mexico Tech, USA, Murat Bengisu worked in the automotive industry in engineering, R&D, and quality departments in Turkey and Italy. Dr. Bengisu started his academic career at Eastern Mediterranean University, Northern Cyprus, in 1999. For one year, he conducted research and taught as Visiting Professor at the University of Missouri-Rolla at the Materials Research Center. Dr. Bengisu completed various self-initiated multidisciplinary projects in collaboration with partners from different fields. He is the author of three books and he contributed to 27 articles in refereed journals. 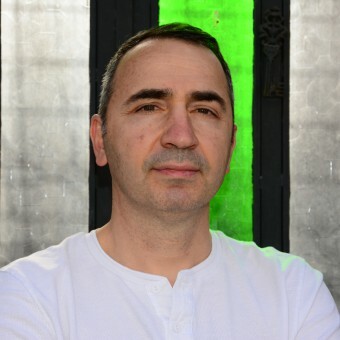 His research interest includes ceramic and glass materials, innovation management, working life and technological needs of disabled individuals, design history (Beykoz glassware) and materials for design. He joined the Industrial Design Department at Izmir University of Economics in March 2008. He was promoted to full professorship in February 2010. Currently he is teaching at the Industrial Design Department. Ph.D., Materials Science and Engineering, New Mexico Institute of Mining and Technology, 1992. M.S., Materials Science and Engineering, New Mexico Institute of Mining and Technology, 1987. B.S., Mechanical Engineering, 9 Eylül University, Izmir, Turkey, 1984. 3.M. Bengisu, E. Yilmaz, H. Oylum, H. Bağlama, In Vitro Degradation of Chitin Beads and Chitosan Films, Advances in Chitin Science Vol.VIII (Eds. H. Struszczyk et al), pp. 329-333. Institute of Plant Protection, Poznan, Poland, 2005. 4.H. Oylum, E. Yilmaz, M. Bengisu, N. Hasırcı, Preparation and Characterization of Chitin Gels - A Comparative Study, in Advances in Chitin Science Vol.VIII (Eds. H. Struszczyk et al), pp. 426-429. Institute of Plant Protection, Poznan, Poland, 2005. 7.M. Bengisu, E. Yilmaz, A. Badreddine, Gelcasting of ceramic parts using chitin and chitosan gels, in Chitosan in Pharmacy and Chemistry (Eds. R.A.A. Muzzarelli and C. Muzzarelli), pp. 299-307. Atec, Italy, 2002. 8.M. Bengisu, Türkiye’li Gözüyle Türk Endüstrisinde Yenileme ve Yaratıcılık, 21. Yöneylem Araştırması/Endüstri Mühendisliği Ulusal Kongresi Bildiriler Kitabı (Ed. F.C.Çetinkaya), sf. 397-400, Doğu Akdeniz Üniversitesi, Gazimağusa KKTC , 2001. 1.M. Bengisu and F. Erdoğanlar Bengisu, Reflections from Late Ottoman Glassware in Contemporary Turkish Design, AAANZ Conference, December 2010, Adelaide, Australia. 2.S. Balta and M. Bengisu, Employment of the Disabled Workforce in the Hospitality Industry, BEST EN Think Tank VIII, Izmir University of Economics, June 2008. 3.M. Bengisu, Evaluation of Technologies for Visually Impaired Individuals, 2nd International Conference on the Dynamics of Science and Technology, Izmir University of Economics, May 2007, Izmir. 4.M. Bengisu, R. K. Brow, E. Yilmaz, A. Mogus-Milankovic, and S. T. Reis, Aluminoborate and Aluminoborosilicate Glasses with High Chemical Durability and the Effect of P2O5 Additions on the Properties, 3rd International Symposium on Non-Crystalline Solids, November 2005, Maringá, PR, Brazil. 5.M. Bengisu, E. Yilmaz, H. Oylum, and H. Bağlama, In Vitro degradation of Chitin Beads and Chitosan Films, 6th Conference of the European Chitin Society, September 2004, Poznan, Poland. 6.M. Bengisu, Türkiye’de Teknoloji Geliştirme Merkezleri ve Teknoparkların Teknolojik Yeniliğe Katkısı ve Başarı Etkenleri, 24. YAEM Ulusal Kongresi, Haziran 2004, Adana, Turkey. 7.M. Bengisu and E. Yilmaz, Chemical Durability of Ceramics and Glasses in Simulated Body Fluid and the Effect of Surface Conditioning, 10th Biomedical Science and Technology Symposium, Oct.10-12, 2003, Girne, Northern Cyprus. 8.M. Bengisu and W. G. Fahrenholtz, Reactive Joining of Alumina by Oxidation of Al Interlayers, 8th ECerS European Conference & Exhibition, 29 June – 3 July 2003, Istanbul,Turkey. 9.M. Bengisu, R. K. Brow, and J. E. White, Interfacial Reactions Between Nickel-Based Alloys and Lithium Silicate Glass-Ceramics, 104th International Conference of the American Ceramic Society, April 28-May 1, 2002, St.Louis, MO, USA. 10.M.Bengisu and E.Yilmaz, Gelcasting of Ceramic Parts Using Chitin and Chitosan Gels, 4th Conference of the European Chitin Society, May 2001, Ancona, Italy. 12.M.Bengisu and O.T. Inal, Plasma Sintering of Explosive Shock-Activated Al2O3-Based Composites, 2nd Ion Nitriding/Ion Carburizing Conference, Sept. 18-20, 1989, Cincinnati, OH, USA. 13.M.Bengisu and O.T. Inal, Rapidly Sintered Particulate Ceramic Matrix Composites, 92nd International Conference of the American Ceramic Society, April 23-26, 1990, Dallas, TX, USA. 14.M.Bengisu and O.T.Inal, Microstructure and Mechanical Properties of MgO-TiC Composites, 3rd International Ceramic Science and Technology Conference, Nov. 2-4, 1992, San Fransisco, CA, USA. •M. Bengisu (Project Supervisor). Research grant for a 1-year project on joining of ceramic materials, National Research Council, Turkey. Total funding 7,526,000,000 TL. Completed on September 2003. •E. Yılmaz (Project Supervisor), M. Bengisu, O. Yılmaz, “Evaluation of Iron Adsorption and Biodegradation of Molecularly Imprinted Chitosan Gel Beads”. Project Budget: 8 500 YTL ≈ 5 000 Euro (for June 2005-June 2006), TRNC Ministry of Education, Scientific Research in Higher Education Institutes Support Program. Press Members: Request an exclusive interview with Murat Bengisu.